What's happening at the Stowe Mountain Resort this Summer? Most people don't think to head up to the Mountain during the summer months, but the Stowe Mountain Resort offers plenty of summer fun! Kids will enjoy sliding down Spruce Peak on the Alpine Slide and bouncing on massive trampolines. Fridays offer a diverse framers market from locally grown food to a variety of crafts. 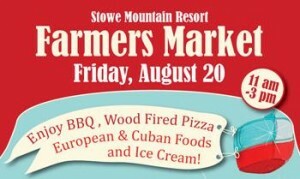 The Stowe Mountain Farmers market is open this Friday the 20th of August from 11-3PM on the Spruce Peak Plaza. For more info on the Farmers Market click here. Let's also not forget the world class spa for those rainy days. If you are lucky one of those rainy days will fall on a Friday afternoon between 5-7PM, where you can enjoy a hand or foot treatment along with cheese and wine for a mere $20. No appointment necessary, what a deal! For more information about this special Stowe Mountain Spa Treatment click here. If golfing is your thing, don't miss the Stowe Mountain Golf Course, recognized by Golf Magazine as one of the "top ten new courses in the US." Check out their Stay & Play deals by clicking here.